The HEALTH HUT is conveniently located in the North Pointe Shopping Center in Hickory, between Planet Fitness and Healing for Life, just a few minutes from downtown or the Lake Hickory area. GMO FREE. We're serious about providing you with safe, time tested and natural foods - not the latest creations from a test tube. Visit the Non-GMO Project to learn more about GMO's and why we just don't need them. 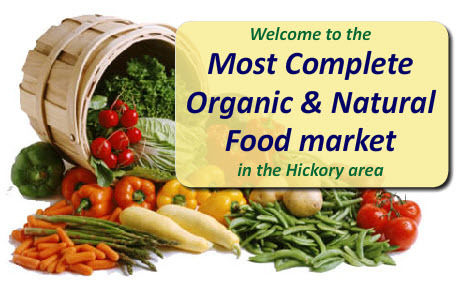 Natural & Organic Groceries, Bulk Foods, Meats, Poultry & Wild Caught Seafood. Plus a Complete Variety of Organic & Natural Vitamins & Herbs, and a Full Assortment of Organic & Natural Beauty Care Products. To encourage you to try our products, we offer a 100% money back guarantee. We're offering a special 10% discount on our regularly priced all natural supplements every Tuesday. Stop in and save! Keep up to date on our specials, plus news & events for the local organic community. Sign up to receive our news by email. 100% Organic Fresh Vegetables & Fruit, Grown the Way Nature Intended. Natural and Organic Cereals, Breakfast Foods and Healthy Snacks for the Kids.